The first contribution to my blog was in March 2013. It was about Dublin. It was based on the city’s unique character, and in particular it was aimed at the tourist and visitor. However, in describing its more important attractions I omitted to refer to its advantages as a suitable ambience for the cyclist, both citizen and visitor. With the exception of a small eminence of about 300 feet at Deer Park on the south side, the city is almost entirely flat and is ideal for cycling, Although the facilities for cyclists are not up to the standards of certain European cities, they are improving steadily as our city fathers are responding to increasing pressure from the active bicycle lobby, particularly thanks to a few cycling lord mayors and the Dublin Cycling Campaign of which I am a longstanding member. In 1994 I was a member of a commission set up in Dublin by the lord mayor, John Gormley, to make recommendations about the future of cycling in the city. We provided a prompt and detailed report. Much of our advice was ignored or long postponed but at least the authorities began to act in building cycling tracks on our main thoroughfares which was a good first step. Hired bicycle facilities have been provided by the city authorities since 2009 and this facility is extending in the city. It has been outstandingly popular and it confirms the excellent suitability of the bicycle as a means of urban and inner suburban transport. It is only one manifestation of the increasing popularity of the bike and this facility is now extending to our inner suburbs. Other factors are adding to the bikes popularity – better and more extensive cycle tracks, some of which are separate from the road and not accessible to motor traffic; the increasing restrictions on motor traffic in the centre city; the growing increase in the number of sturdy cycle stands and greater efforts to discourage the all too frequent stealing of bikes. There is a slow but welcome improvement in the relations between motorists and cyclists as the latter become more familiar with the rule of the road, already well established among motorists. I find drivers in Dublin, with few exceptions, treat cyclists with caution and courtesy. Cycling is often described as dangerous. I do not agree with this contention but far too many cyclists drive dangerously. And most accidents and deaths among cyclists are caused by lack of care and ignoring the rule of the road. A big factor in the safety of cycling is the recent banning of all lorry and heavy vehicles from the city centre and the provision of the 5-kilometer tunnel and the city’s encircling M50 which have taken much of the heavy traffic off the inner city. There are also financial inducements provided by the civil service and industry to those who cycle to work and on business. It is hoped that the S2S scheme (Sutton to Sandycove) pathway and esplanade will soon be completed and will allow walkers, runners and cyclists to travel the 15 mile coastline and outer docks of the city. This exciting proposal should have been completed by now but is being delayed by one of our local authorities on the grounds of a bird sanctuary which may be endangered. No city can boast a more accessible and attractive coastline and its many opportunities for leisure pursuits. 2nd from right with my siblings and cousins at Lissenfield. I acquired my first bike in 1937 when I was 15 years old. It cost one pound and was bought at a police auction. We were a big family with two acres of land in the inner suburbs beside Portobello Bridge on the Grand Canal but we had little money and no luxuries. We did however, have an orchard, an extensive vegetable garden, our own poultry and a milking cow which we maintained by renting the adjacent military field in Portobello (now Cathal Brugha) Barracks. We sold some milk to nearby cousins and eggs to our neighbours on Rathmines Road. We were in many ways self-supporting thanks to my mother’s genes derived from her farming family in Co. Wexford. When the cow went dry after months of service it was necessary for Ned, our outdoor amanuensis, to lead the beast across the city to be sold at the cattle market in Smithfield. On one occasion while I was in my mid or late teens I was encouraged by my mother to accompany him, a prospect which did not appeal too warmly to me, and which was greatly increased when, as we passed the popular Bewley’s Café in Grafton Street, the beast suddenly stopped and relieved herself of the full contents of her innards in the middle of the street and to the amusement of the surrounding passers by. 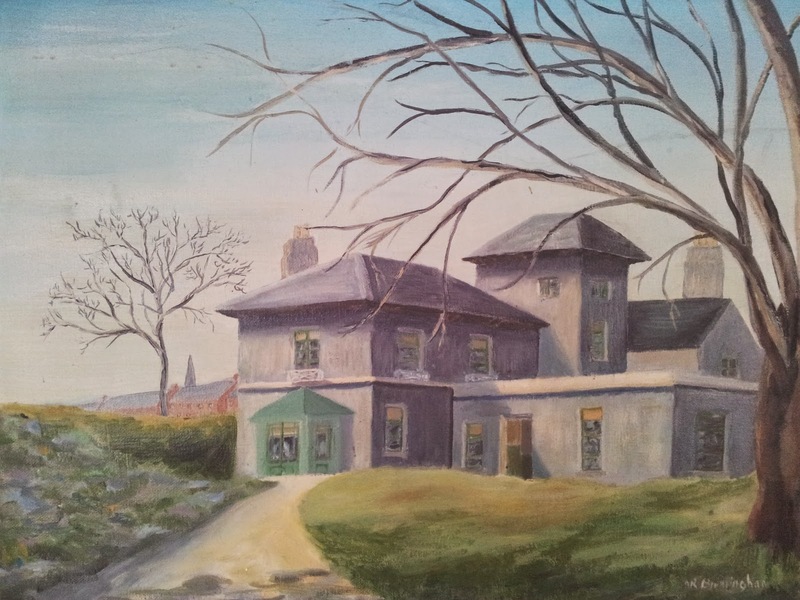 According to my mother the family – parents, six children, a cook, an early child minder and later teaching overseer, and an outside worker as gardener and cowhand (who lodged with his wife and children in the lodge at our gateway) - we lived on a total income of £640 in 1936 derived from my father’s TD salary of £350 and his army pension of £300. In order to acquire a bike I was obliged to plant and care for a plot of onions which provided me eventually with the money to attend the police auction. From that time I travelled everywhere on my new acquisition which survived its many vicissitudes of punctures, broken chain links and occasional buckled or broken spokes for eight years until I departed to London for four years of postgraduate studies. I travelled across the city for the last two years of my school days and then for six years to the university and hospital which I attended closer to my home. Because of the problems of transport created during the war years, I and my friends in the university travelled the four corners of Ireland on our bikes during the holidays, despite the number of breakdowns and problems suffered by our heavily laden bikes. On one occasion we cycled the 132 miles from Galway to Dublin in eleven and a half hours, including a stop at Athlone to climb to the top of the campanile of the new cathedral which had just been consecrated there. We left our one female friend to leave Galway at midday by train. The train by this time late in the War depended on turf for fuel and needed to have the fuel and the ash replaced every 20 miles or so. We arrived in Dublin at 11.30 pm and had still five hours to await the arrival of the train at Westland Row. Her journey lasted 16 hours! In later years and on better bikes I and my brother-in- law, Tommy Bacon and his daughter, Helen, did the maracycle from Dublin to Belfast in eight hours with a nasty north-easterly wind which made an unwelcome appearance as we reached Drogheda. We ended in glorious sunshine, lying exhausted but happy on the lawn of the City Hall in Belfast, supplied with champagne and sandwiches by northern friends. It was surely the most heavenly moment of my life. During the next three days we cycled the coasts of Antrim, Derry and Donegal and finished in Cavan with the bikes in the back of a bus for our return to Dublin. At the age of 24 I went to London as a postgraduate doctor and my cycling days came to an end for the following 35 years whilst I was a consultant in my two hospitals in Dublin. In 1981 I found myself close to my hospital and able to resume some limited cycling. My colleague, Ronan Conroy, was a member of my research team whom I described in my autobiography Memoirs of a Medical Maverick as a polymath–"gifted conversationalist, writer, linguist, statistician, maths and computer genius, instrumentalist and musician". In my biography I omitted that he was an ardent cyclist. He had acquired a new bike and in 1981 offered me one of his older models, a cruising Record Raleigh of recent vintage which he valued at £100. I thought the bike rather expensive but, after further independent advice, I yielded to his arm-twisting. (The most expensive bike I found at last year’s cycle exhibition at the RDS was priced at Euro 7,000!) It was expensive at the time but no bike has ever served its master more faithfully than my Raleigh over 33 years and no bike has had a more proud or protective master. I was too well aware of the frequent theft of bikes and I took the greatest care to avoid such an event, even to the point of insisting that I carry it into a shop or house in vulnerable areas and by carrying the most effective (and expensive) lock. My new bike gave some service for the final eight years before I had retired from my hospitals. At the same time I had taken up running and did three marathons in the early 1980s. 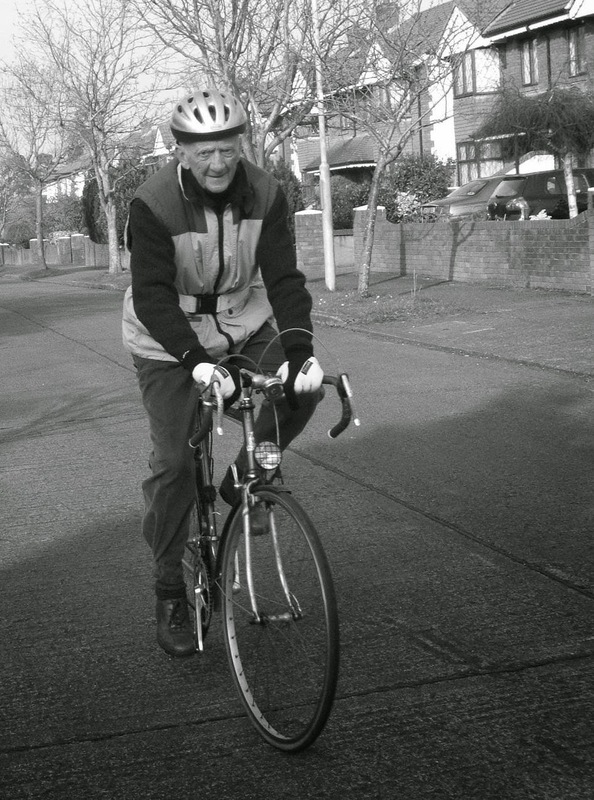 Cycling remained a limited part of my daily life until I had a hip replacement in 1994 which terminated my running. Since then cycling and walking remain important in my daily life, particularly after I retired from driving at the age of 90 years. Thirty three years of cycling has contributed to fulfilling the mantra "Keep you legs strong". Like walking and running, it has greatly contributed to my health and vitality over the years. Most of the debility we find in ageing people can be attributed to allowing the legs to lose their strength prematurely. Keep your legs strong will ensure that you will never spend the latter years of your life bent and disabled, unless of course you are unfortunate enough to suffer some catastrophic injury or illness. And if you are a cyclist, choose your bike carefully and protect it from theft or injury. It is a great tribute to my "expensive" bike, and to its design and quality, that it has lasted in full heath for its 35 years and hopefully it will serve its next owner as long and as faithfully. Young lovers and their steeds.